The closure of the News of the World has put about £35m worth of advertising up for grabs but press buyers are being guarded about where the budgets might be reinvested. Yesterday News International, part of News Corporation, announced it was to close its Sunday red top News of the World in response to the public outrage over the extent of phone hacking at the paper. The profitable paper sold 2.6 million copies and generated about £35-40m in advertising every year, and the question now is who will reap the rewards of the available spend. Press buyers have suggested that they expect the revenue to stay in the print, as the reasons for choosing press still stand, but that it was too early to say where the ad revenue might be spent. Unlike other media such as TV, press ad spend is placed very late and buyers suggested most advertisers will not have committed a large amount to the News of the World in advance allowing it to be easily redeployed. Agencies expect that one of the biggest beneficiaries could by Associated Newspapers the Mail on Sunday, which had a circulation of 1.9 million according to figures from the Audit Bureau of Circulation for May. It has also been suggested that advertisers might look to run ads in the Sunday Mirror, which had a circulation of 1.1 million in May 2011, and the Sunday Express, circulation 563,397 in replacement for the News of the World, though how much duplication of clients there is between the papers has not yet been established. Chris Locke, group trading director at Publicis Groupe media agency StarcomMediaVest, said: "Where money will go will depend on whether it is Sunday strategy or a more general Sunday strategy. "No-one's come to me to ask how they can take extra money but it's not a conversation to have with the media owner, it's a conversation to have with clients. Do they want to go into The Sun or move into something else?" 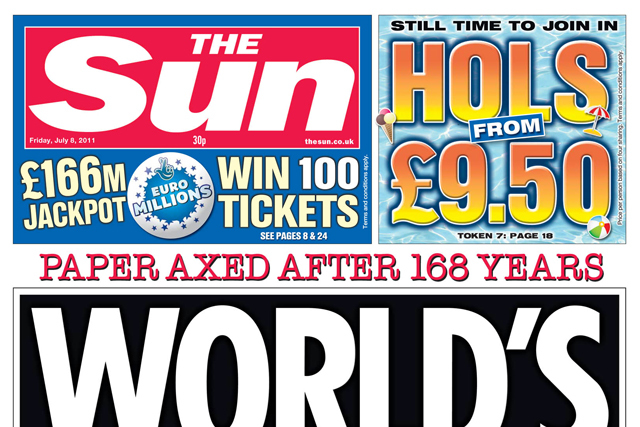 Another media agency trader suggested that as ad rates are higher in The Sun, if News International moves quickly to replace the News of the World with a Sunday Sun it could end up generating more income than it has in the past. Adam Smith, futures director at WPP's media buying operation GroupM, said "the loss of a Sunday paper is about as serious as you can get" from an advertising investment point of view and was "enough to do measurable damage to the [print] medium". Smith claimed the NotW's closure would make life difficult for clients in three categories - travel, entertainment and supermarkets. "The News of the World has no obvious substitute [for advertisers] and so investment won't be as efficient as it used to be", Smith said. Smith did not think that the event would necessarily lead GroupM to downgrade its forecast for the growth in print adspend this year as advertisers might have to spend more money with remaining newspapers to achieve their objectives. Amy King, head of press at MPG Media Contacts, said: "In the short term there's only a few media the News of the World adspend can go into. I think it will move across into other titles and potentially outdoor as well because a lot of the advertisers that use the News of the World are retailers and they need their message to get out there immediately." However, King said her agency would hold fire for a couple of weeks on ads for a couple of clients who did not have time-sensitive messages to put out. Speculation is mounting that the Sun will be made available in some form seven days a week but News International have batted away questions, saying it is too early to make a decision on a Sunday Sun, and when contacted this morning would not comment beyond yesterday's statement by James Murdoch.